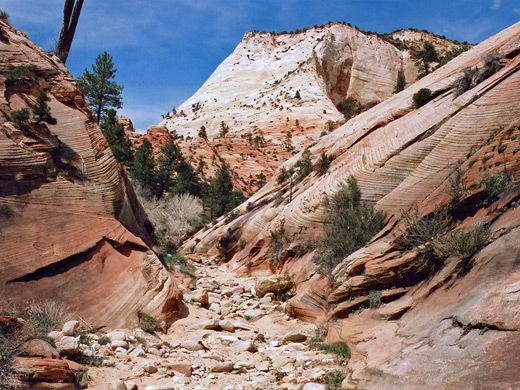 UT 9 approaches Zion National Park from the southeast via the deep valley formed by Clear Creek, a large, branched drainage that winds through beautiful scenery of huge white Navajo sandstone cliffs and domes, then joins the main Zion Canyon after the Pine Creek slot. 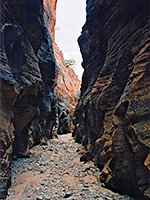 Although not generally very enclosed, Clear Creek has several good short stretches of narrows, all within a few minutes walk of the road, and about a dozen side canyons which may or may not have slot sections, though they tend only to be deep and V-shaped. Highway 9 provides easy access to all of Clear Creek and its tributaries. There are plenty of small lay-bys for parking, although those towards the lower end, near Pine Creek and the Zion-Mt Carmel tunnel, can become rather congested. 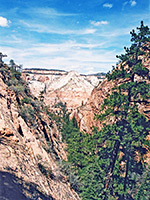 A $25 Zion National Park entry fee is required to drive along the road and explore the creek. 14 views of Clear Creek and side canyons. TopoQuest topographic map of Clear Creek. Clear Creek runs just to the south of UT 9 for most of its length - from the junction with Pine Creek, where the valley is almost 1,000 feet deep, it crosses to the north side close to the park entrance station and heads off into the wooded slopes of the Kolob Terrace. The pebble-filled streambed is generally 20 to 50 feet below the road and passes through various sections of narrows, perhaps the best of which is either side of the Washington/Kane country line, where creek and road run around the end of a protruding ridge; here the creek has passages 6 feet wide beneath high red/grey cliffs, eroded into the wavy patterns characteristic of Zion slot canyons. A walk of a mile or so along any part of the valley should encounter some similar sections and even when not narrow, the creek is always very pretty, though in some places the otherwise tranquil atmosphere is spoilt by traffic noise from the nearby main road. Some parts are liable to have long pools that remain for many days after rain, which may restrict hiking somewhat. 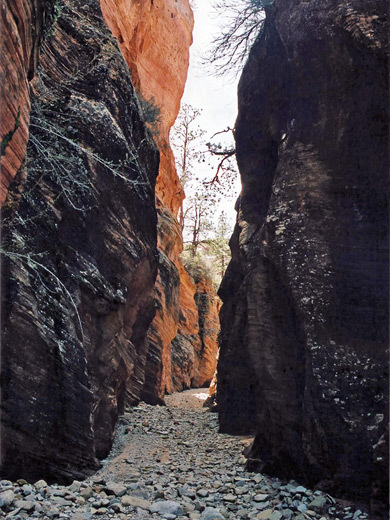 There are about 12 side canyons of the Pine Creek/Clear Creek valley, from Garfield Canyon in the west, just after the end of the road tunnel, to an unnamed ravine opposite Checkerboard Mesa in the east. 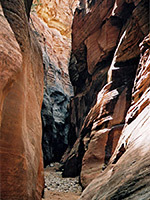 The only other with an official title is Keyhole Canyon, 1/4 miles west of the Washington/Kane country line; not signposted but popular because of a short technical slot section that needs 3 easy rappels to descend. A round trip from the road, up and over a ridge into the middle of the drainage then down the rappels and through a short flooded section back to the road is only about half a mile. 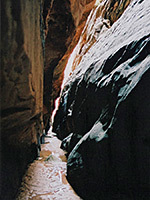 Of the other tributary canyons, the first after the Zion-Mt Carmel tunnel on the north side of Pine Creek (known as Shelf Canyon) has a very short but dark and narrow section that is worth visiting, while the canyon on the south side closest to Keyhole is not so interesting as it gains height quickly with several high dryfalls, eventually affording great views of the distant slickrock surroundings but with no narrow passages. The others doubtless also have much to offer.